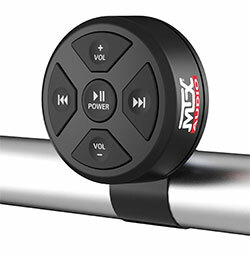 Whether you have a motorcycle, boat, UTV, or all-terrain vehicle (ATV), an increasing number of outdoor sports vehicle enthusiasts are adding a sound system to listen to great tunes while they ride. 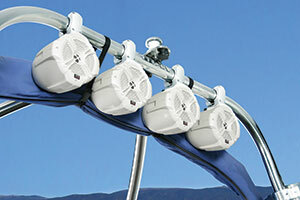 Marine components are designed to withstand greater vibration and weather extremes. They are also rated to resist moisture. Note, marine grade does not mean waterproof. Some rain or spray is fine but don't try to run them underwater, bad things will happen to that poor speaker. Smaller sized amplifiers are a great investment given the often tight spaces one must use for mounting. 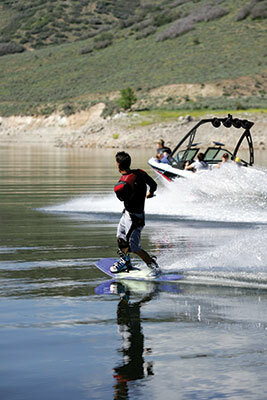 Boats and bikes as well as some UTVs, may require fastening speakers to a roll or wake board bar. Many marine speakers are designed for this method if no wall or ceiling is available. And, of course, mount the speakers pointed at your ears as much as possible. High notes can be very directional regardless of speaker type. Compared to a car or home audio system, the same stereo outdoors will seem to have less volume and punch at the same setting. Indoors or out, sound level drops off by the square of the distance, which means ¼ of the sound volume remains for every doubling of distance from your ears to the speakers. But indoors, or in your car, the walls, floor and ceiling amplify the sound over a wide open outdoor vehicle. Even the echoes from indoor walls add music depth that will seem lacking outside until you increase the volume. And lastly, if you are thinking of having a camp or dock party big, more powerful speakers and amplifiers are always better. You won't want to take your eyes off the road, so ensure volume is close by and easy to reach. If you are using your mp3 player or a smart phone as your music source, find a secure area to stash it or buy a dash mounting bracket. So next time you shop for an audio system for your sports vehicle, remember to buy rugged, sealed and small components to fit planned mounting locations... and have fun! Check out all the options available from MTX for you bike, boat, or UTV from the menu above.